The Portuguese are obsessed with Bacalhau. This traditional food is one of Portugal’s most treasured dishes. 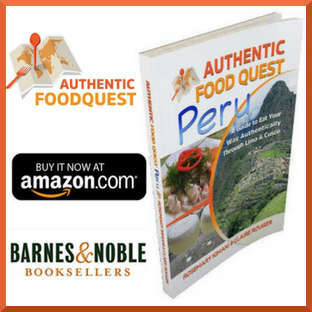 It is eaten baked, barbecued, canned, with potatoes, with rice, and so many other ways. There are over 365 ways of preparing bacalhau, and some say over 1,000 ways of serving it. Surprisingly, bacalhau is not native to the coastline of Portugal. 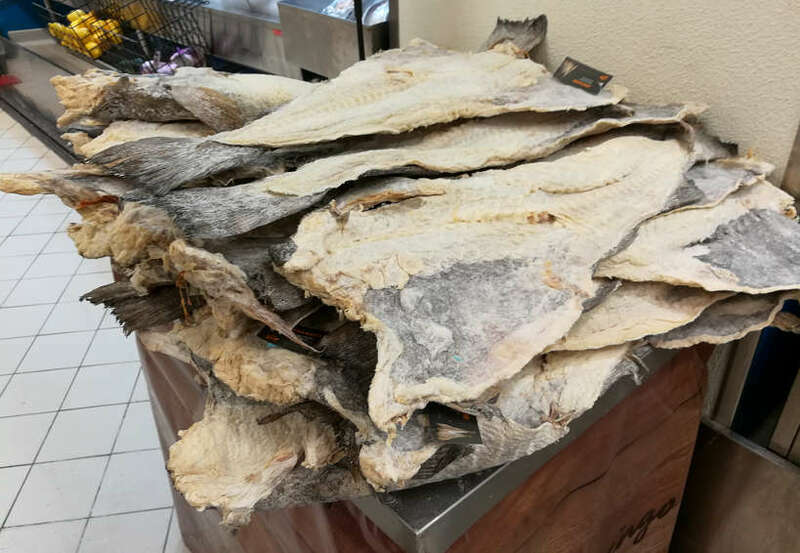 Bacalhau is imported from Newfoundland or Norway and has been an integral part of Portuguese cuisine since the 16th century when Portuguese fishermen first brought it back from Newfoundland. We eagerly ate our way through Portugal, sampling the different preparation styles of this national dish. While we didn’t come close to eating all 365 or 1000 different recipes, we did eat enough codfish to feed our ravenous appetites. Here, we share our favorite bacalhau dishes. 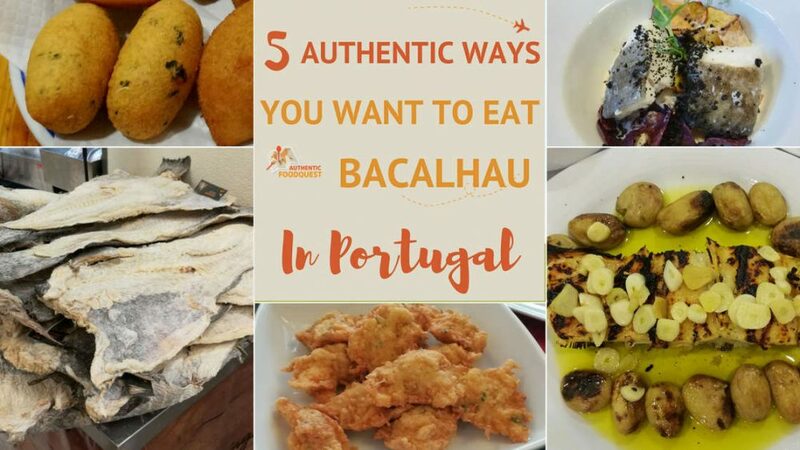 Join us for an amazing culinary journey of our top 5 authentic ways you want to eat bacalhau in Portugal. Bacalhau à Brás is one of Portugal’s most popular dishes and one of our favorite ways of eating codfish. What’s wonderful about this dish is that it is so simple and yet so delicious. The dish consists of combination of Bacalhau (cod) pieces mixed together with potatoes, eggs, onions, olives, chopped parsley and garlic. The origin of the recipe is uncertain, but it is said to have originated in the Bairro Alto neighborhood of Lisbon, by a tavern owner named Braz. Due to the spelling of the name, the dish is also sometimes referred to as Bacalhau à Braz. 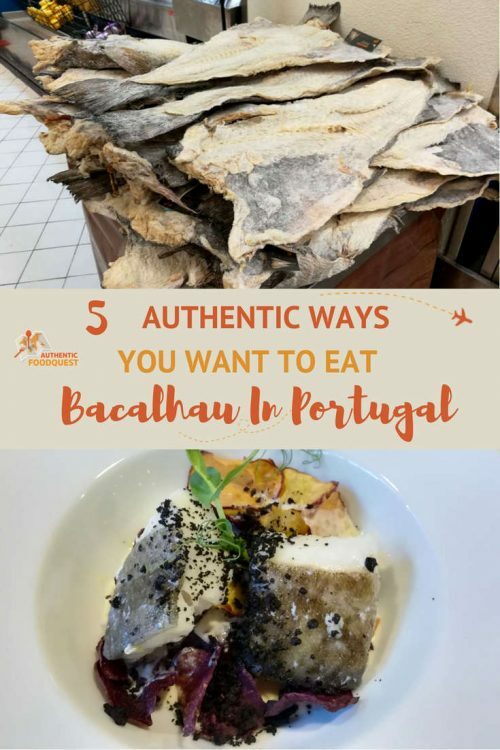 We had Bacalhau à Brás several times at different restaurants and even learned how to cook it at our Airbnb. Our favorite preparation was at Incomum Restaurant in Sintra. The chef, Luis Santos, put a creative spin on the dish with the addition of delicious vegetables and the eggs lightly battered and fried. So delicate and delicious, you’d easily make the 45 minute trip to Sintra from Lisbon, just for the creative touch of chef, Luis Santos. A lot of Portuguese dishes are prepared with olive oil or simply grilled. With Bacalhau com Natas, you get to experience a delicious Portuguese dish made with cream. They are several variations of this dish. Though it mainly involves cooking codfish with potatoes, onions, and cream. 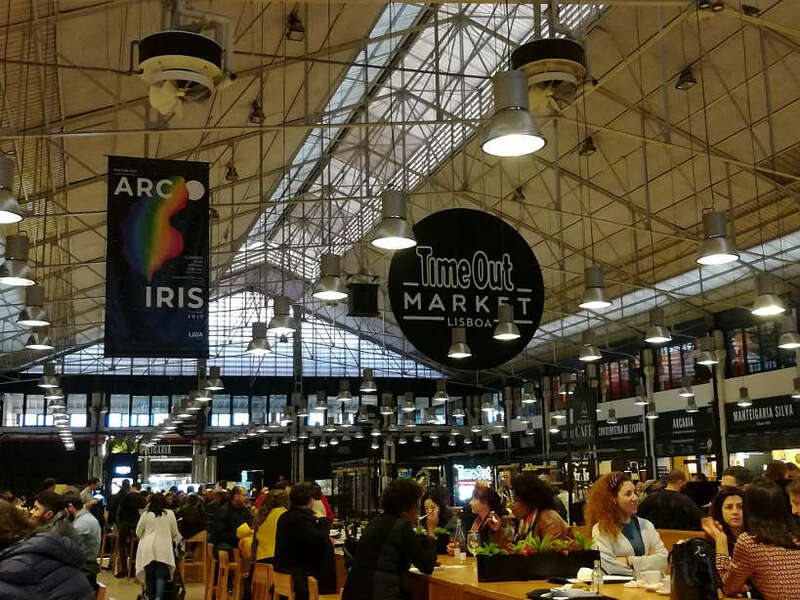 At the Time Out Market in Lisbon, you can taste some of the favorite Portuguese dishes made by the best chefs in town. This is the case at Cozinha da Felicidade. Cozinha da Felicidade literally means “Kitchen of Happiness”. 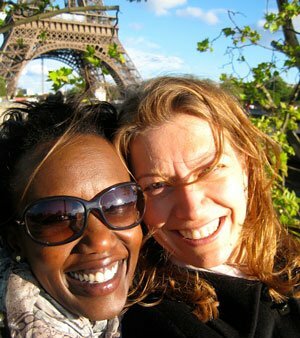 It is named after the chef, Susana Felicidade. She prepares a delicious adaptation of the Bacalhau com Natas with sweet-potato chips and olives dust. The codfish is divinely prepared. It is really fresh and the flesh is tender and soft. The delicious cream is enhanced by the olive dust bursting in the mouth. 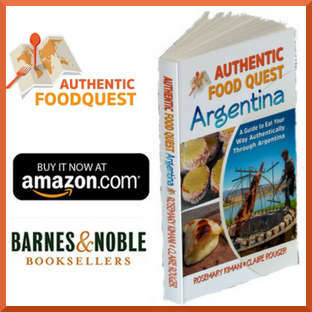 This is definitely a must-try if you are looking for an original way to savor this traditional codfish recipe. Pasteis de Bacalhau or cod fish cakes are also called bolinhos de bacalhau in Northern Portugal. These cod cakes are one of the most popular ways to eat codfish in Portugal. These delicious cakes are made with mashed potatoes, codfish, eggs, parsley and onion. Shaped with two spoons, they are deep fried before being served hot as an appetizer. You can also find them as a main dish with rice, salad and olives. With such popularity, it is easy to find Pasteis de Bacalhau all over Portugal. You will find this delicious snack in cafes, restaurants and pastelerias, which are Portuguese bakeries. 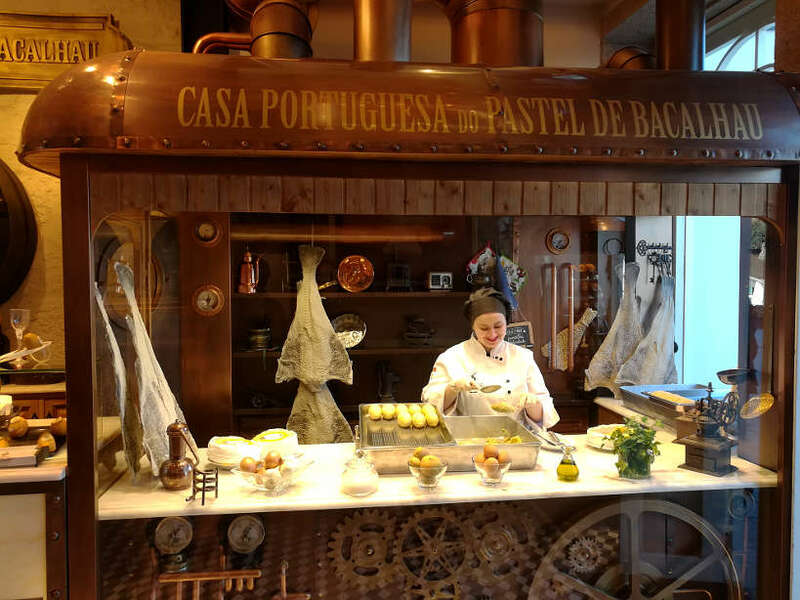 Although deemed to be a tourist trap, Casa Portuguesa do Pastel de Bacalhau serves an interesting version of Pastel de Bacalhau. This concept store has reinvented the way the codfish cakes are made. Making Pastel de Bacalhau in front of your eyes with a smile! They combine the traditional codfish cake with the famous Serra da Estrela Cheese into one delicious Pastel de Bacalhau. This Pastel is about twice the size of a typical Pastel de Bacalhau and for €4 euros, it is also quadruple the price! Casa Portuguesa do Pastel de Bacalhau has two locations. The first open was in Lisbon and they now have a second location in Porto. 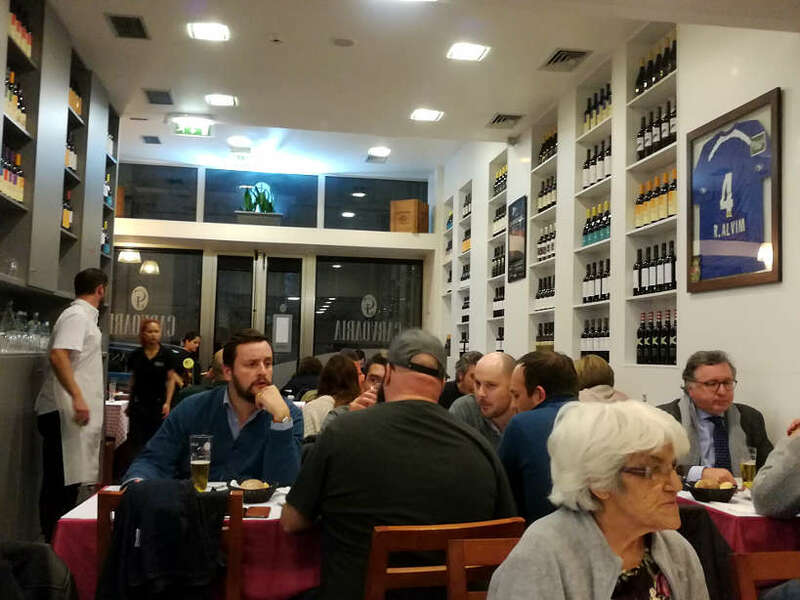 We tried it in Porto, where, for €9 euros, you get the Pastel de Bacalhau and a glass of white Porto wine. This might be the perfect combination. First, as you bite into the codfish, you taste the delicious melted Estrella cheese. 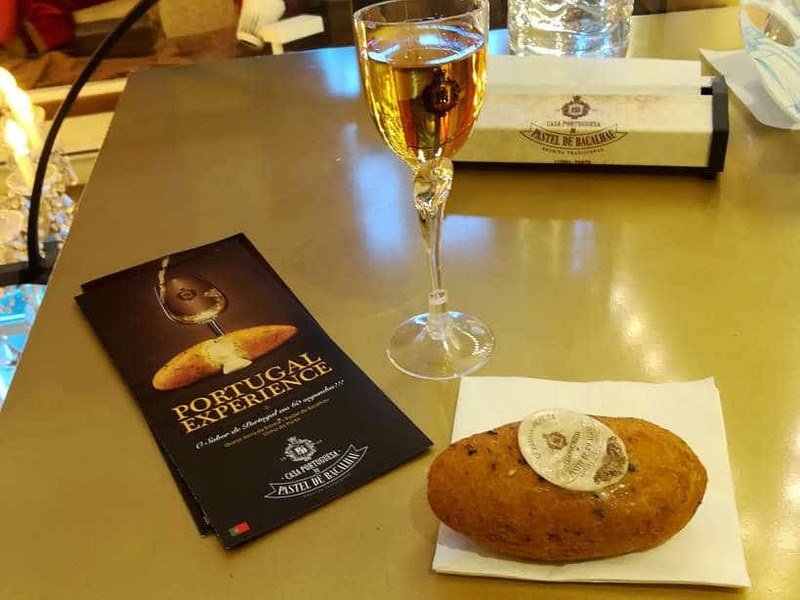 To accompany this delightful treat, you sip on a glass of Porto white wine. Although pricey, it is worth the experience. Hours: Everyday, 10:00 am to 8:00 pm in Porto, until 10pm in Lisbon. This modest dish exceeds expectations. It is prepared in a very simple fashion consisting of roasted codfish with potatoes. The secret to this exquisite dish is the use of good quality ingredients. The cod needs to be of high quality and the finest olive oil completes this dish. Typically, the cod is seasoned with salt, garlic, onions, vinegar and generously sprinkled with very good olive oil. It is accompanied with roasted potatoes and this simple combination is a classic of traditional Portuguese cuisine. After eating this dish a number of times and tasting the variations in quality, we found our best Bacalhau Assado Brasa com Batata a Murro dish at a local Lisbon restaurant. Carvoaria Jacto Restaurant is in the non-touristy neighborhood of Penha de França. Be warned the portion sizes are humongous. Go hungry or plan to share. What makes this dish stand out is the use of high quality codfish. 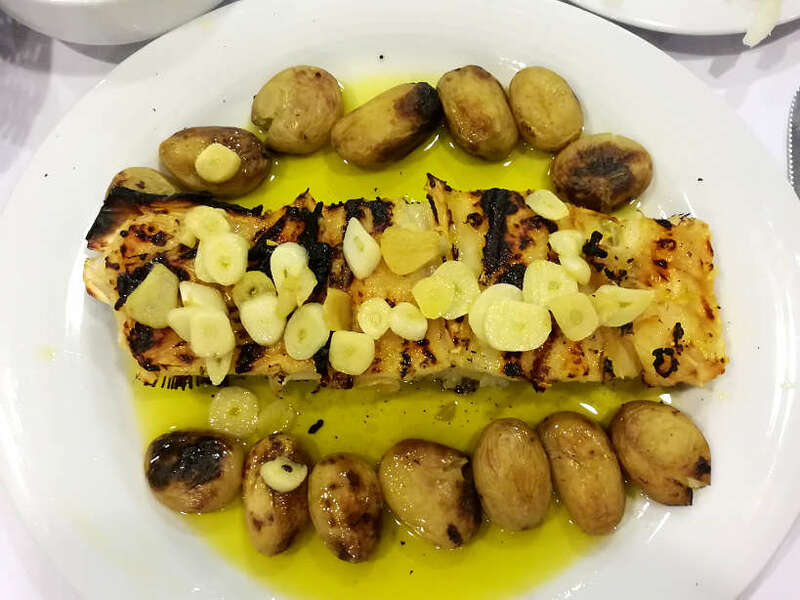 The cod is perfectly grilled and when drizzled with olive oil and paired with the delicious potatoes, you get the true essence of authentic Portuguese cooking. Pataniscas de Bacalhau are delicious cod fritters. This is another version of the Bacalhau that is deep fried. The cod fritters are made with eggs, flour, codfish, eggs, parsley and onion. The dough is made by mixing all the ingredients together. The cod fritters are then deep fried into a pan before serving them hot as an appetizer or as a main dish with rice. At Flagrante Delitro, you get to taste Pataniscas de Bacalhau with the typical soupy rice, arroz de feijao, made the Portuguese way. The cod fritters are made fresh, lightly fried, served with the hearty rice, perfect for the winter months. In addition to serving delicious Portuguese staples, Flagrante Delitro is part of Casa de Fernando Pessoa. 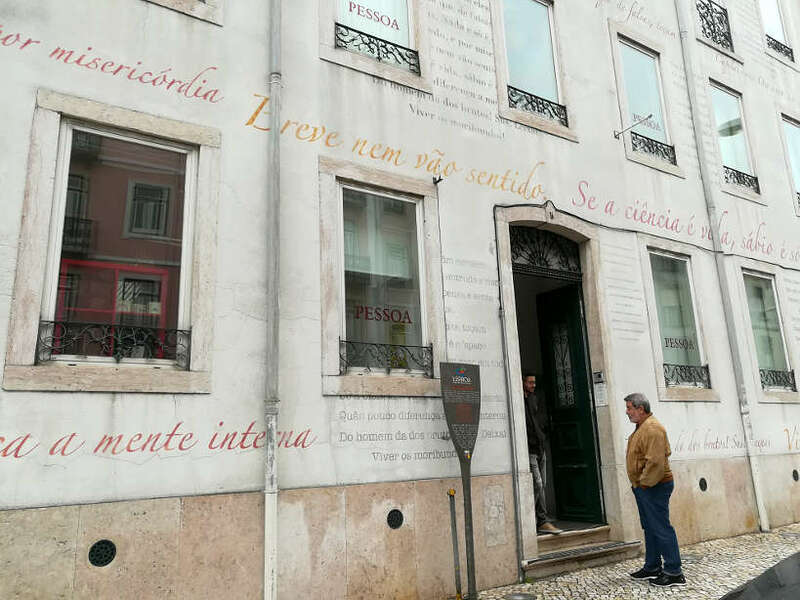 This cultural house is dedicated to the famous Portuguese poet, Fernando Pessoa, where he lived his last 15 years in Lisbon. The name Flagrante Delitro is actually inspired by the famous photo that shows the poet drinking a glass of wine in downtown Lisbon, sent to his lovers with the dedication “in flagrante delitro”. It is actually a play on word with the expression “caught in the act” – “flagrante delito”. 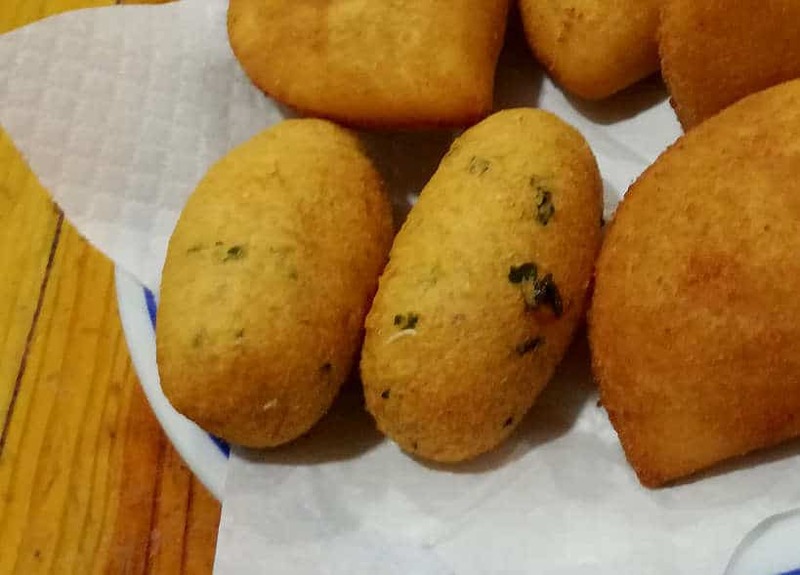 Having cod fritters at the Casa de Fernando Pessoa is a delicious way to immerse yourself into the local culture. 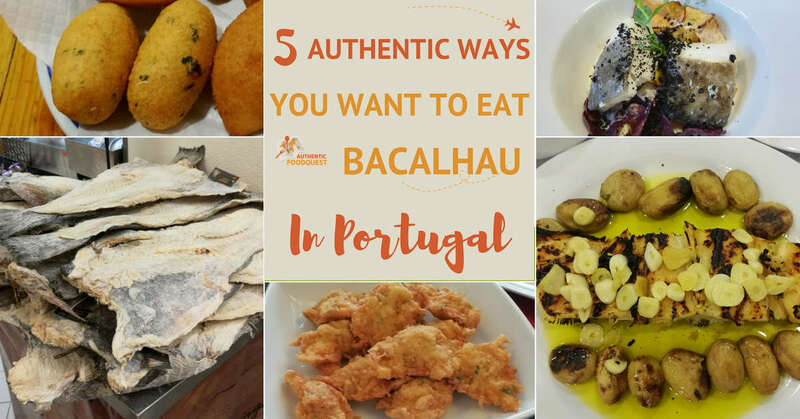 With these 5 Bacalhau dishes, you can taste some of the most popular and the tastiest way to enjoy Bacalhau. Even if codfish is not your favorite dish, you’ll find a version to satisfy your curiosity and appetite as you eat bacalhau in Portugal. Learn how to make codfish and other delicious Portuguese dishes when you take a cooking class in Lisbon. How about you? What is your favorite way to eat codfish? That’s awesome to hear that your diet allows you to eat codfish. You will love all the different preparation styles in Portugal. The two versions that you like best were also two of our favorites. The Portuguese use a lot of garlic, so you’ll be in good shape. So much good bacalhau in Portugal. Definitively worth visiting soon. Thanks for stopping by!! Wow, can’t believe you missed Bacalhau in Portugal. Definitively head back soon. So many delicious ways of eating this delightful fish!! Love the concept of your entire blog, such a fantastic idea. I hadn’t heard of this dish until now, so will definitely be giving at a try at one of your recommendations next time I’m visiting Portugal! Awesome Caitlin. So glad you’ve been inspired to try bacalhau on your next trip to Portugal. Appreciate your feedback about our blog. Truly appreciate it. 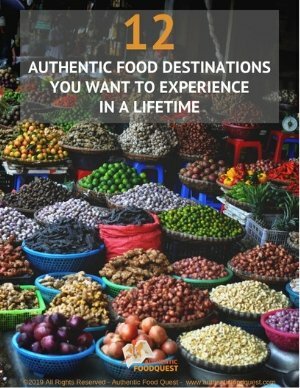 Stop by regularly for the local foods not to miss on your travels. Cheers! They are indeed all yummy Ashley…the cod fritters, in particular, are divine 🙂 Indeed, a trip to Portugal must be had!! Thanks for stopping by! You hit me hard with this post! I am from Puerto Rico and grew up eating bacalhau. I live in California now and cannot even think about getting some codfish because it is super expensive in here. In Puerto Rico it is prepared in stews, combined with rice, in salads (with avocado, tomatoes and onions) and in fritters (those are my favorites). I need to visit Portugal to eat codfish every day. I already did that in Spain. That’s so interesting to read Ruth that bacalhau is also popular in Puerto Rico. The cod fritters was also one of our favorite ways of eating it. When you go to Portugal, do let us know the differences you find. Love the simplicity of this dish. Thanks for stopping by. That’s great to hear Hiral. 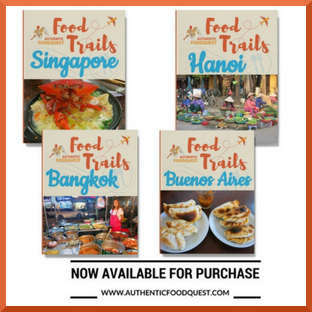 Our goal with Authentic Food Quest is to inspire people to travel through the local foods. Glad this article opened you up to a new perspective regarding bacalhau. Appreciate your feedback and thanks for stopping by. 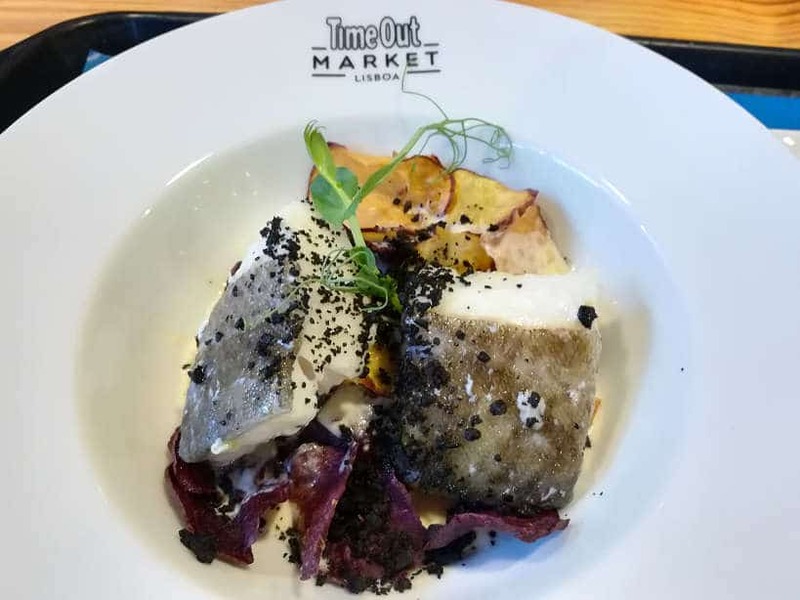 I really liked the Time Out Market in Lisbon but I didn´t try Bacalhau there. Maybe next time 😉 Great post! 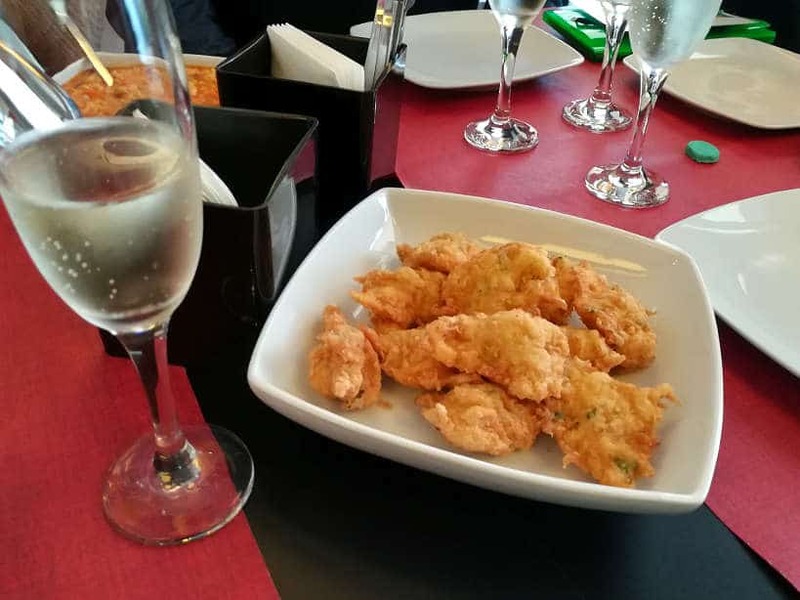 I heard about Bacalhau when I was in Portugal, but I had no idea there were that MANY ways – the codfish cake with the wine sounds like a really good combination, I want to try it now! We were constantly amazed every time we learned about a new way of preparing bacalhau. The Portuguese are quite inventive. The bacalhau with cheese and wine is quite tasty, though not traditional. If you can, sample a variety preparation styles and be prepared to be amazed. Thanks for stopping by! Everything looks yummy. I can definitely eat Bacalhau in whatever preparation it’s done. Would love to try these dishes when I get to visit Portugal. Not feeling the salted codfish much, but it looks incredible cooked in the otger dishes. I’d be sure to try it when in Portugal. Not feeling the salted codfish too much, but it looks amazing cooked in tge other dishes. Would definitely try when in Portugal. 365 ways of preparing it, perfect for every day of the year! As a huge fan of cod, I am going to have to visit Portugal to try some authentic Bacalhau. I had never even heard of it, so thank you for sharing. The history and dinner at Flagrante Delitro sounds like my kind of meal. Maybe I can get my wife to get a recipe and make some for me, since I won’t be able to visit Portugal anytime soon. Problem is they all looked so yummy I will have to get her to make at least a few of the dishes you talked about! Awesome, Chris, please share with your wife. All the different styles are quite unique. 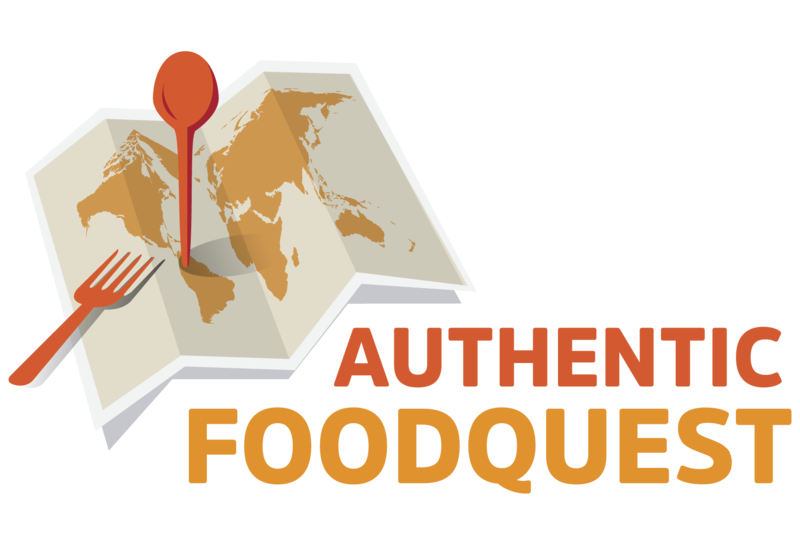 Try some of the dishes at home, but a trip to Portugal to taste their authentic flavors must be experienced. I never knew how deeply seeded Bacalhau was in Portuguese cuisine. I will have to try it when I visit. An interesting geometric fact with the pastels. If they are twice the radius and 4 times the cost, it still might be a good deal. The volume of a sphere goes up by the cube of the radius so you might be getting a lot more food. You are indeed getting a lot more with the larger size bacalhau pastel. But do keep in mind it is also stuffed with local cheese. The next time you are in Portugal be sure to explore the range of preparation styles. Quite amazing!! Never heard of bacalhau before so this would be new for us! Can’t believe there are over 1000 ways to serve it. Very cool! The deep fried ones sound yummy! Over 365 different ways to prepare it? Who knew! That pastel with cheese and bacalhau and porto wine looks so amazing. I’ve never tried codfish before and am not a huge seafood person, but these dishes all look pretty appealing! The way you have described the dishes made me crave for them. Pictures are some thing to die for! I have to visit Portugal again. All I remember is eating prawns there. How did I not have this when I was in Portugal???!! We were only there for a day but now I’m going to have to go back because it looks delicious! I definitely want to try the roasted codfish with potatoes. YUM! 365 ways to make codfish? And it’s not even Native to Portugal? That amazes me. It all looks yummy but i think I’d be hooked on the fritters! Yes, you are right, the passion is strong for bacalhau in Portugal. The fritters were delicious and most importantly, not greasy! !Thanks for stopping by! I’m heading to Portugal next week and I’m always excited to dive into new cuisine. I’m not a huge fan of fishy-tasting-fish. Would you say the codfish is super fishy-flavored. I think the fritters or fish cakes piqued my interest the most. Actually, the codfish is not fishy tasting at all. And, with all the various preparation styles, you’ll be sure to find flavors you’ll enjoy. Enjoy your trip and eat loads of bacalhau for us!! Interesting that it’s not native to the Portugese coastline though overtime has become the country’s traditional dish. 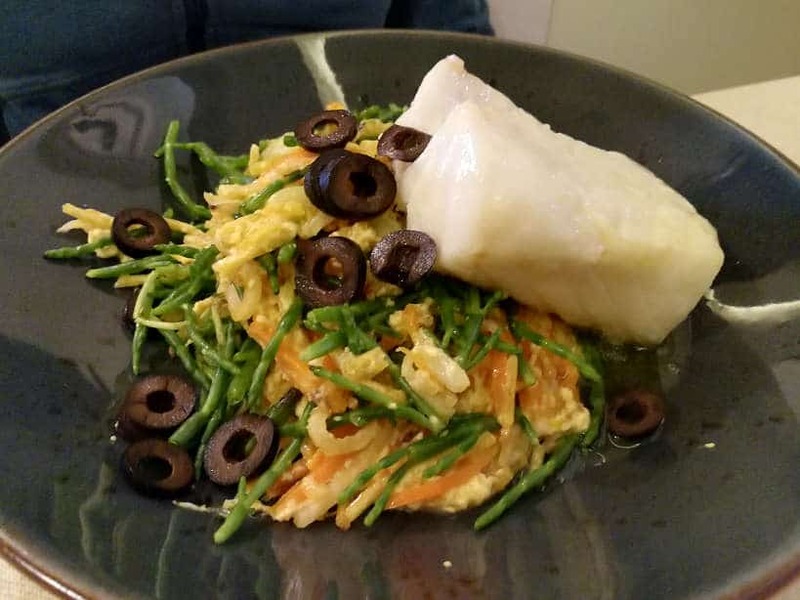 Bacalhau à Brás does sound like it would be a really lovely dish – I love the simplicity of it. Will have to keep a mental note of Incomun Restaurant for my next trip. That said, Bacalhau com Natas looks really good too, and I could totally go for some Pataniscas de Bacalhau right about now! So interesting that there are so many different takes on a national dish. Might have to try all five and report back on which one I enjoyed the most 😀 Thanks for the tips! You are most welcome, Meg. The simplicity and deliciousness of this dish is amazing. Are you traveling to Portugal soon? Hope you get a chance to try them all and then some. Please do let us know what you think!! Cheers and thanks for stopping by! Thanks Alli for stopping by. As a fish lover you would love cod fish. It’s light and delicate and incredibly delicious, particularly with all the preparation styles. Look for it the next time you order fish 🙂 Cheers.